Sean Kelly Gallery is delighted to announce a major exhibition of new works by Marina Abramovic. This is Abramovic's first solo exhibition in New York since 1997. The exhibition is comprised of a major new performance The House with the Ocean View which the artist describes as the most important one of her career to date, Dream Bed - a sculpture the public can use and Stromboli - a new video installation. 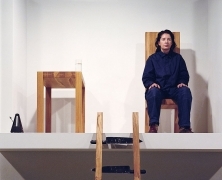 Each work demonstrates part of Abramovic's concern with creating works that ritualize the simple actions of everyday life like lying, sitting, dreaming, and thinking; in effect the manifestation of a unique mental state. As a vital member of the generation of pioneering performance artists that includes Bruce Nauman, Vito Acconci, and Chris Burden, Abramovic created some of the most historic early performance pieces and is the only one still making important durational works. The House with the Ocean View is a public living installation: for the first twelve days of the exhibition Abramovic will fast following a strictly defined regimen in three specially constructed living units in the main gallery space. 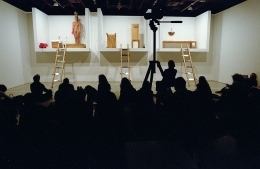 For this unique and challenging performance, the gallery will have special hours (see below), to facilitate repeated attendance by the public, as their presence is integral to the work. Dream Bed is a sculpture which visitors are contractually invited to use for one complete hour. Each user will thus participate in the ritualization of sleep, dreaming and/or lying. The public's involvement parallels Abramovic's commitment in The House with the Ocean View. Appointments to use Dream Bed can be made by contacting the gallery. Stromboli, a single channel 30 minute video, is named for the island south of Sicily that is the only permanently active volcano in Europe and has experienced small eruptions approximately every 15 minutes for the last 2000 years. In the video the artist lies at the edge of the ocean, between land and sea, her head moving in response to the waves. Marina Abramovic, born in 1946 in Belgrade, Yugoslavia, is without question one of the seminal artists of our time. She was awarded the Golden Lion for Best Artist at the 1997 Venice Biennale for her extraordinary video installation/performance piece Balkan Baroque. Her work is included in many major public collections worldwide including: Solomon R. Guggenheim Museum, New York; Musée National d'Art Moderne, Centre Georges Pompidou, Paris; the Stedelijk Museum, Amsterdam; the Van AbbeMuseum, Eindhoven; Irish Museum of Modern Art, Dublin; Kunstmuseum Bern. 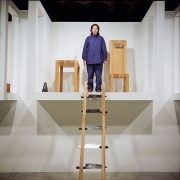 Recent solo exhibitions have included: Marina Abramovic: The Hero, Hirshhorn Museum and Sculpture Garden, Washington, DC; Marking the Territory, The Irish Museum of Modern Art, Dublin; The Hunt, Center for Contemporary Art Kitakyushu, Kitakyushu; Spirit Houses, Bourganeuf; Marina Abramovic, Fondazione Antonio Ratti, Como, and Public Body – Artist Body, Kunstverein Hannover. Abramovic has an important forthcoming retrospective in 2005 at the Kunst und Ausstellunghalle der Bundesrepublik Deutschland, Bonn.